Luxuriously soft and fluffy, our comfortable Black Bones Large Dog Bed is the perfect gift for your loveable pet. Your pet will surely enjoy the white bone design on black colour texture. Filled with 100% hollow fibre, this large size dog bed is very durable, resilient and handy. With the casing of high quality polycotton casing, you can easily hand wash it so that you pet can enjoy a neat and tidy sleeping experience every day. Bedding Mill offer wide range of luxurious and comfy dog beds to demonstrate your love, care and concern for your dear pets. Our lavishly soft and comfortable dog beds are made from high quality material. 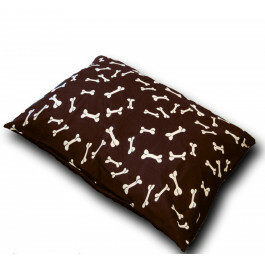 You dog will surely love to sleep on our sumptuously soft and durable dog beds. Apart from being decorative and showy, our Soft and fluffy beds will give them immense comfort and support. Your dearly dog will surely have a serene sleep on our quality dog beds. Our plump dog beds will easily distribute your pet's body weight uniformly throughout, giving relief to their achy joints and pains. Your furry friend would be happy to have his own personal space to cuddle and relax. 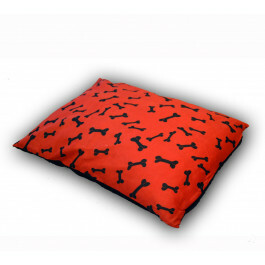 Available in ample of sizes, these dog beds are versatile and long lasting.